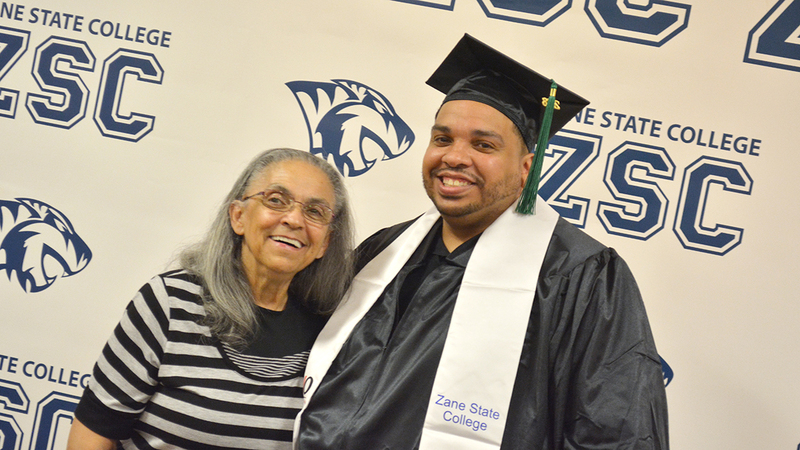 Zane State College Commencement is Thursday, May 9, 2019, at Secrest Auditorium, 334 Shinnick St, Zanesville, OH 43701. You should arrive at Secrest at 5:30 p.m., and proceed directly to the lower level of Secrest Auditorium for check in. After check in, you can take photos with your friends and faculty, request songs for the DJ to play during the after party, and get prepared to cross the big stage. Guest seating is on a first-come, first-served basis and will begin at 5:30 p.m. Tickets are required for admittance. Before the ceremony, The Campus Bookstore and Alumni representatives will be on site with special graduation items for sale. Stop by the Alumni tent on your way in if you need help with directions. They will also be selling flowers (proceeds benefit the Alumni fund). The Campus Bookstore will have a mini-store set up in the lobby area. Your name won’t really be cast in stone… but make sure your name is spelled correctly before we print the commencement program! Here is the list: 2019 Commencement Grads. Proofread your name, and if corrections are needed, email registrar@zanestate.edu via your ZSC email or visit the Registrar’s Office in College Hall by April 23. All participants must wear a black cap and gown. Your tassel color will reflect your program. Caps, gowns, and tassels are available for $31, and gold honor cords (for those who are eligible) are $12. Items can be purchased at The Campus Bookstore in The Campus Center. Commencement ticket distribution began on April 16, 2019, at The Campus Bookstore. All tickets must be picked up by Thursday, May 2, 2019, by 5 p.m. Photo ID is required to pick up tickets. Each graduate will be given 5 tickets for their guests. Students who petition late run the risk of not getting tickets. If you have not petitioned for graduation, please do so right away. If any graduate or guest requires special seating accommodations, please indicate this on the ticket sign out sheet. Graduates are not required to present a ticket to be admitted and participate in the Commencement ceremony. Children (three and younger) who are seated on laps are not required to have a ticket. Graduates may request additional tickets on the ticket sign out sheet; however, there is no guarantee that extras will be available. Monday, May 6: Graduates who request extra tickets will be informed of availability via ZSC email and text. 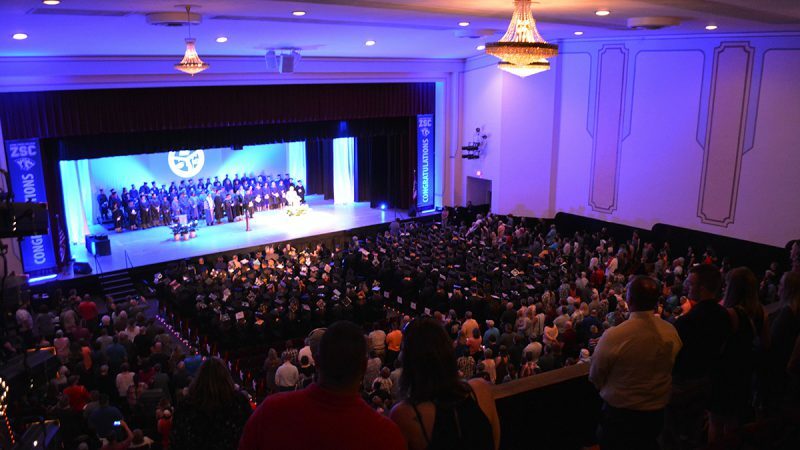 Wednesday, May 8: If there are extra tickets, graduates must pick them up at the Bookstore by 5 p.m.
All students petitioning for a degree or one-year certificate, even those who are not participating in commencement, are charged a fee of $60. For your convenience, please click here for payment options (see the shortcuts section on the right of the page to make your payment). Diplomas and transcripts will be held until all debts with the College are cleared. This includes library fines, too. If you borrowed Federal Student Loans during your enrollment at Zane State College, you are required by law to complete EXIT COUNSELING to review your rights and responsibilities as a borrower. Go to https://studentloans.gov and log in to complete exit counseling for your Federal Stafford Loan. Zane State College will receive notification of your completion. Your official transcript will be held until you complete this process. In addition, we recommend that you review and monitor your federal loan and grant history. The National Student Loan Data System (NSLDS) web site (nslds.ed.gov) provides this information as a complete listing for each student. If you have questions or need assistance, please email fasworker@zanestate.edu. 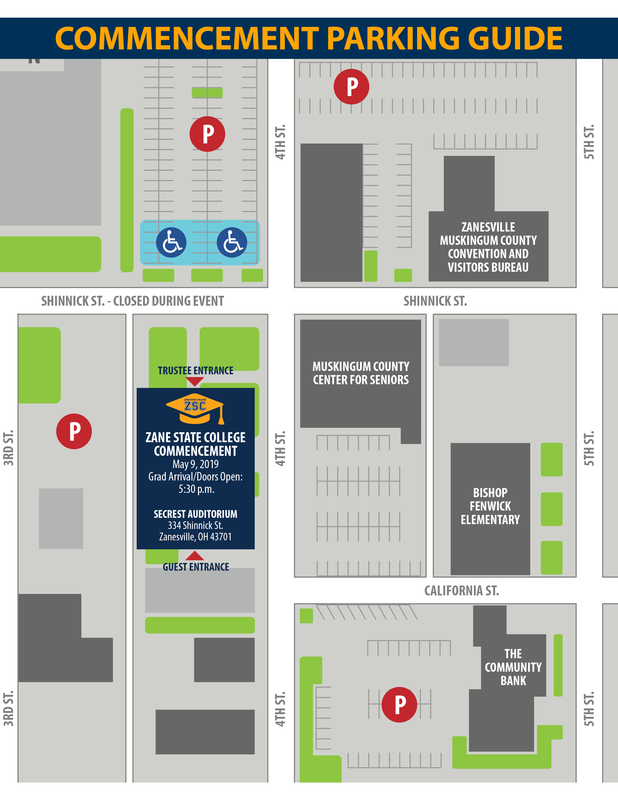 Click the map below for reserved lots surrounding Secrest Auditorium. Look for signage for where you need to stand. We will have assistants on site for any questions. If you are getting two or more degrees, choose which division you prefer. You will shake the hand of the Division Dean when you walk across the stage. You will be able to sit with friends. We’re excited to announce that this year’s commencement speaker is Ohio Supreme Court Justice Sharon L. Kennedy. Bethaney Brown is Zane State College’s 2019 American Sign Language Interpreter. 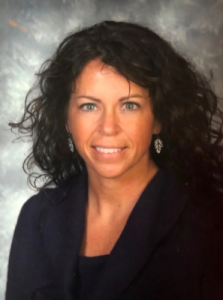 A Zane State College alumna, she began the path that led her to interpreting at Zane State College (then known as Muskingum Area Technical College), completing her associate degree in 1993. She tested and became certified at the national interpreting certification (RID) level in 2003. In 2008, she completed her bachelor’s degree from Ohio University. She completed her master’s degree in 2016. Most of her 18 years of interpreting has been in the education field. She is currently employed as a Language Specialist within the Department of Defense but continues to freelance interpret in the community. Bethaney continues to live in her hometown of Zanesville with her two sons, Ayden and Wyatt. A professional photographer, not affiliated with the College, will take photos of graduates as they walk across the stage. GradImages, Inc. will then contact you with package purchase options a week or two after commencement. After the commencement ceremony is over, join us in the lower level of Secrest to celebrate! Munch on party bites, get photos with your friends in the photo booth, request your favorite song to the DJ, and indulge in a dish of Zane State College’s 50th Anniversary Ice Cream (Monado’s Fudge Claws and Peanut Butter Paws). This event is hosted by the Student Services team! The Campus Bookstore and Alumni representatives will have a mini-store on site so you can purchase some ZSC Alumni merch and flowers, too. Cash and credit accepted. Get your photo in front of the Muskingum County Courthouse that night. It will be ZSC Blue in honor of our grads. The registrar must review and verify graduation requirements for each student. Diplomas and certificates will be mailed to graduates with no account holds approximately six to eight weeks after the end of the graduation term to the address on file. Please check your My ZSC biographical information section to verify correct mailing address. Multiple attempts to mail diplomas will not be made; diplomas returned by the post office will need to be picked up in person at the Registrar’s Office. 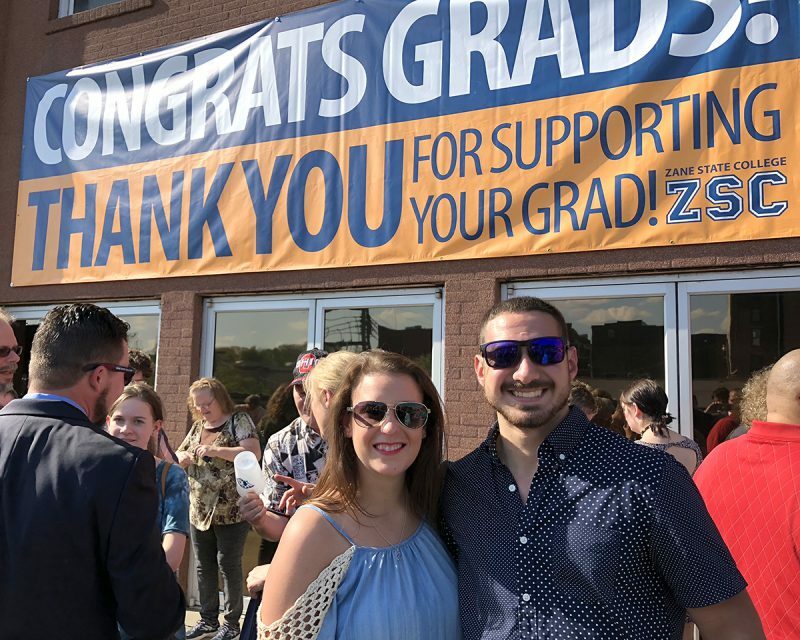 We welcome you as an alumni of Zane State College! A Graduate Status Survey will be enclosed with your diploma. Please take a few moments to complete and return it in the postage paid envelope provided. Stay in touch with the Alumni Office! Email any changes to name, address, phone number, email, or employment to alumni@zanestate.edu. Save the date to celebrate Zane State’s 50th birthday on Saturday, September 21, 2019. Everyone is welcome to have FUN, eat good FOOD, and enjoy MUSIC on our Zanesville campus on the Campus Green. 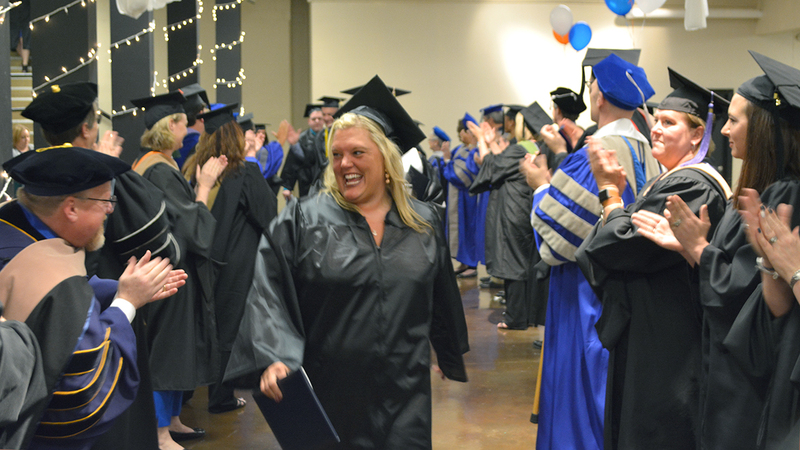 Graduates will receive an electronic survey after commencement from Career Services. This important survey will ask you information regarding your employment and future education plans and only takes ten minutes to complete. The Office of Career Services is here to help with resume writing and career assistance even after graduation. You may also continue to access your collegecentral.com account. If you have any questions or need assistance, please contact ZSC Career Services. Last updated 4.18.19. All information is subject to change. We recommend checking back regularly for current information.